Mike Fiechtner Photography || Seattle Wedding, Family and Senior Photographer — Date night was a good one!! Date night was a good one!! Mandy and I have recently started having date night every Tuesday night so we can enjoy each other and do something fun. Well this last Tuesday my wife had the great idea of catching the bus downtown after work to take some photos. Mandy also wanted to learn how to use my camera. Mandy was very much into photography when she was in school and did all of the developing of the film herself. I was super excited because of my new obsession and sharing the time with Mandy. Lately Mandy has been giving me a lot of grief about my photography and getting into something creative. She keeps telling me that I'm getting into her territory and stealing her thunder. I'm supposed to stick with taxes and all my accounting nerdy stuff and stay away from anything creative. Mandy and I had a blast working together and I think we got some pretty cool shots. It was so much fun to work with her in getting these pictures because she is so much more creative than I am and does a good job with composition. Mandy also thinks further outside of the box and pushes me to think of different ways to capture the same thing. 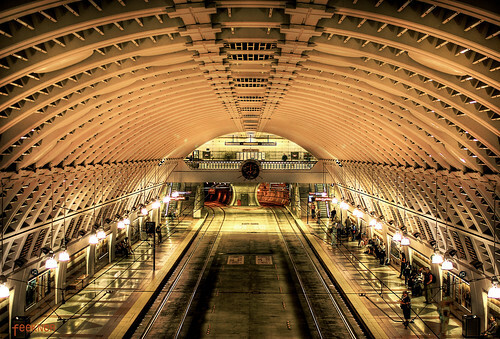 The first photo is down in the bus tunnel at Pioneer Square. It's a photo that I've seen others do but I'd been meaning to try it. When looking at the EXIF data I was surprised to see that the focal length was 33mm. I could have sworn I was at 18mm to capture the full tunnel. The whole time I was there all I could think about was the lens I've been dreaming about. The Canon 10-22mm which would get me a lot wider shot which I think would have worked better. 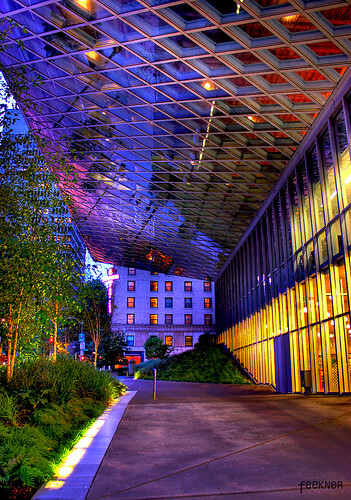 The second photo is outside of the Seattle Downtown Library. I was really excited with how this turned out. The HDR created an array of colors and so in flickr I titled it Reading Rainbow. If you like my photography please check out my flickr account here or leave me a comment on the blog. I love to hear your feedback both good and critical. Thanks for reading!